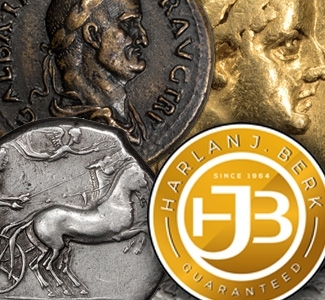 These seven coins are just a sample of the 713 recent additions to our inventory. 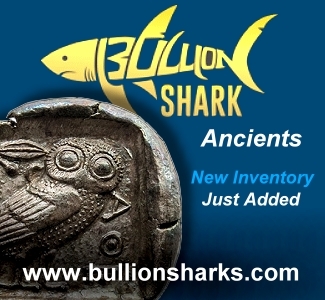 We have added new material in Ancient (60), World (647) and US (6). 1038377 | GREEK. SICILY. Syracuse. Dionysios I. (Tyrant, 407-367 BCE). 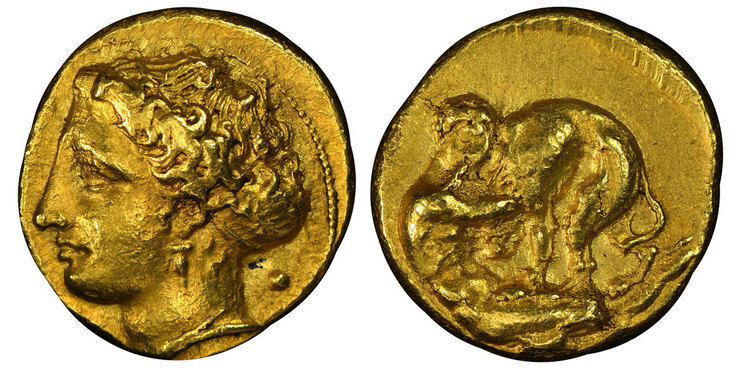 Struck c. 405-400 BCE. AV 100 Litrae. NGC Ch. AU (Choice About Uncirculated) Strike 4/5 Surface 4/5. 5.79gm. [ΣΥΡΑΚΟΣΙΩΝ]. Head of Arethusa to left, her hair bound up in a sphendone ornamented with two stars, wearing a single-pendant earring and a pearl necklace; globule in field before and behind her neck / Youthful Herakles kneeling to right on rocky ground line, grappling with the Nemean lion. 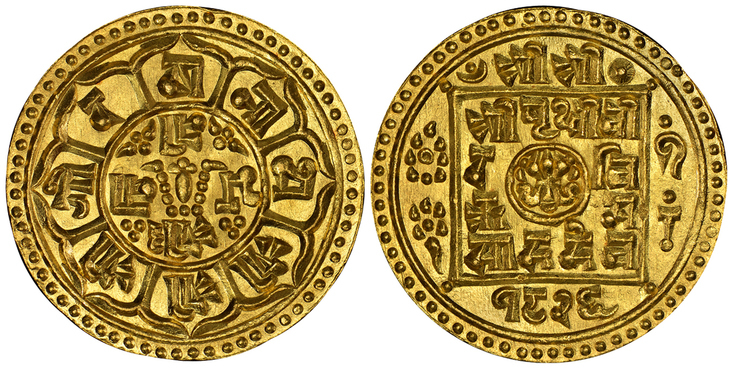 Bérend 14/1, 2 (this coin); SNG ANS 327-328 (same dies); SNG Lloyd 1421. Unsigned, but by Euainetos. Very rare. Lovely deep cabinet patina. 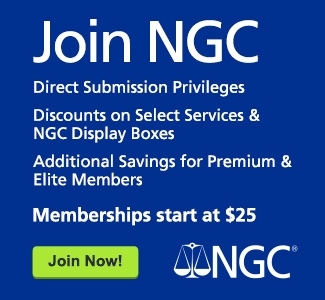 Please use this link to verify the NGC certification number: 3990735002. 1036074 | ROMAN IMPERATORIAL. Julius Caesar. (Dictator, d. 44 BCE). Struck circa 46 BCE. 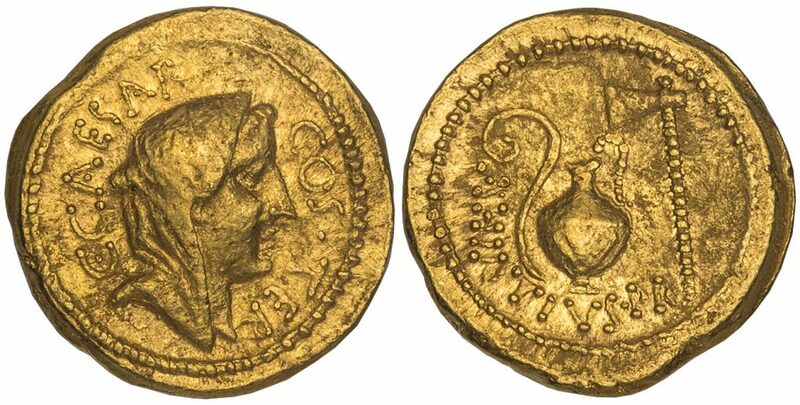 AV Aureus. NGC AU (About Uncirculated) Strike 5/5 Surface 4/5. Rome. A. Hirtius, praetor. 8.00gm. C • CAESAR – COS • TER. Veiled head of Vesta, right / A HIRTIVS P R. Lituus, jug, and axe. Crawford 466/1; Sydenham 1017; Calicó 36. 1038942 | FRANCE. 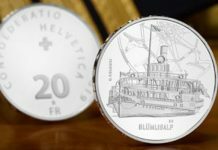 1896 AV 100 Francs. NGC MS61. Paris. Edge: DIEU PROTEGE LA FRANCE. 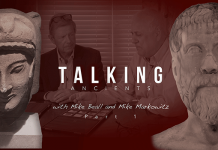 Standing Genius writing the Constitution, rooster on right, fasces on left / Denomination above date within circular wreath. KM 832; Friedberg 590. 400 pieces minted. Lovely prooflike surfaces, much more attractive than the grade suggests. 1039192 | NEPAL. Shah Dynasty. Prithvi Bir Bikram. 1826 AV Mohar. NGC MS67. Inscription / Inscription. KM 673.1. 1038957 | SWITZERLAND. 1897 (ND) Nickel 20 Francs, Uniface. 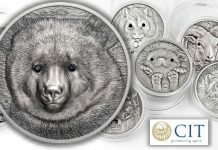 PCGS SP64. Young head left. KM TS1. Mintage of three pieces, exceedingly rare. 1038229 | NETHERLANDS. Holland. The Seven United Netherlands. (1581-1795). 1596 AR Medal. PCGS AU50. 55mm. · SIDERE · PROFICIANT · DEXTRO · NEPTVNIA · REGNA (rosette stops) (May maritime authority be profitable for us through a favorable omen.). 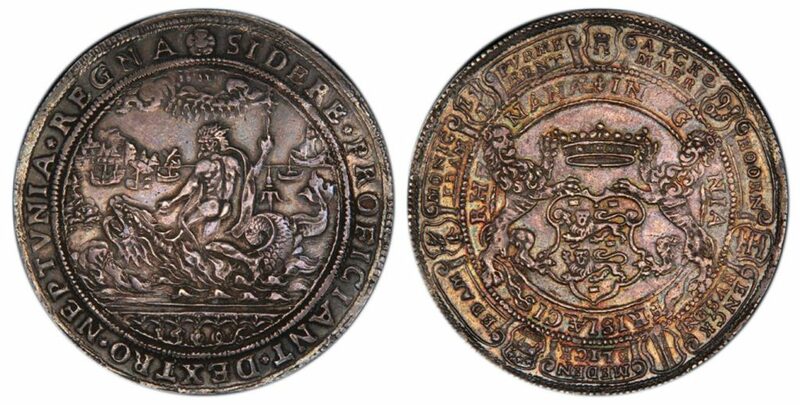 Neptune, holding trident, riding sea monster left, holding trident; port and ships on sea in background; above, rayed name of God in Hebrew; 15·96 below / (lis) INSIG NIA FRISIÆCIS RHENANÆ (The coat-of-arms of Rhinish Frisia). Crowned coat-of-arms with leonine supporters; in border, alternating coats-of-arms and scrolls containing the city names Alkmaer, Hoorn, Enckhusen, Medenblick, Edam, Monicedam, and Purmerent. Betts 16. Commemorating the Reopening of Maritime Commerce. 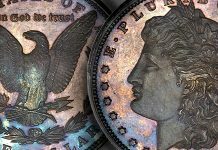 We note that an uncertified example of this type described as “VF” realized $30,550 including the Buyer’s Premium at public auction in January, 2013. Superb and exceptional, excellent strike for the issue and lovely deep cabinet patina. Quite possibly the finest surviving example of this extremely rare Betts medal. Housed in an oversized holder. 1038521 | GREAT BRITAIN. Victoria. 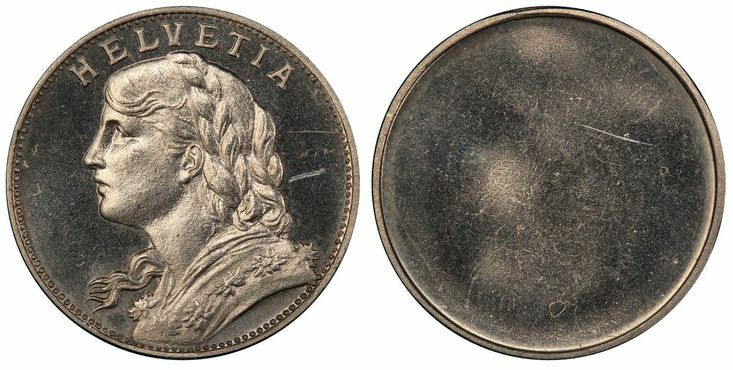 (Queen, 1837-1901). 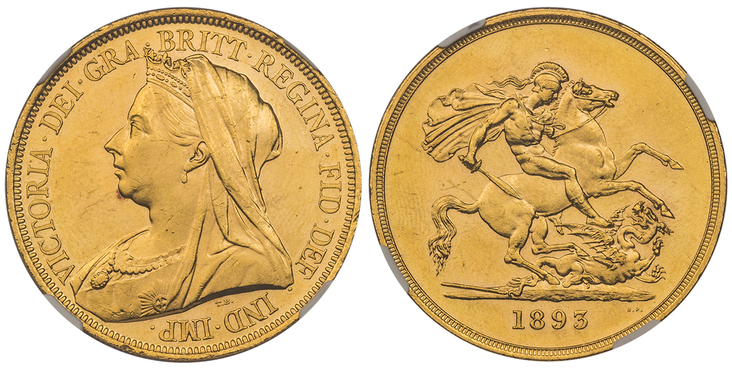 1893 AV Five Pounds. NGC MS64. VICTORIA. DEI. GRA. BRITT. REGINA. FID. DEF. IND. IMP. Veiled bust left / St. George slaying the dragon right. KM 787; SCBC 3872; Friedberg 374. 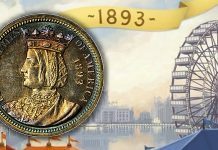 Atlas Numismatics will be attending the following numismatic conventions. Please stop by and say hello if you have a chance. 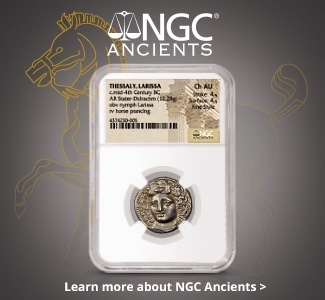 Atlas Numismatics is actively seeking to purchase individual items and whole collections. 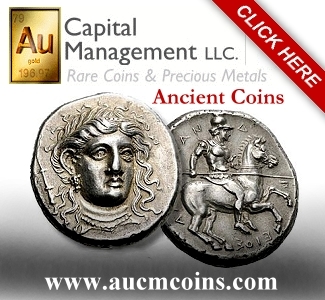 Please contact us if you have rare or exceptional world, ancient or United States coins for sale; click here for more information. Updates to their online inventory are issued monthly. 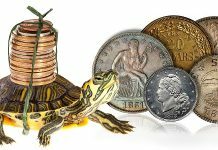 For more information and to sign up for the firm’s monthly newsletter, visit www.atlasnumismatics.com.